Product prices and availability are accurate as of 2019-04-16 13:17:19 EDT and are subject to change. Any price and availability information displayed on http://www.amazon.com/ at the time of purchase will apply to the purchase of this product. 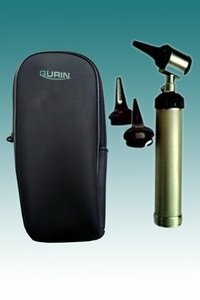 3.2V Professional Diagnostic Otoscope Kit with 3 specula and zippered leatherette case. Our kit also includes a Disposable Specula Adaptor that allows you to use disposable specula if you are in clinical practice. This unit is BRAND NEW and the latest model from the manufacturer, RA Bock Diagnostics. It is of chrome plate brass construction which is very durable. The handle uses 2 "C" alkaline batteries (not included) to supply power to an ultra-bright high intensity 3.2 Volt halogen bulb for a very bright light. The heart of any otoscope is in it's lens. Like all the finer quality otoscopes ours uses an optical quality GLASS lens that is specially-coated to help resist scratches. The lens uses a 5X magnification and is hinged and swings aside for cleaning and easy access. IMPORTANT: The otoscope head attaches to the handle with an advanced design Luer-Lock mount instead of a small screw to hold the head in place. This is the way all higher quality otoscopes lock the head in place. Our otoscope even has an all metal insufflator outlet, to facilitate use of an insufflation bulb if you choose. You will be impressed with the clarity and definition this otoscope will deliver on visualizing the tympanic membrane.